“USE MORE, it’s fine” sends an ironic message at the entrance to the LA Cleantech Incubator for JUNK BATTLE!, April 20. On April 20th, I spent the day in downtown Los Angeles helping Pando Populus with the inaugural JUNK BATTLE! event. 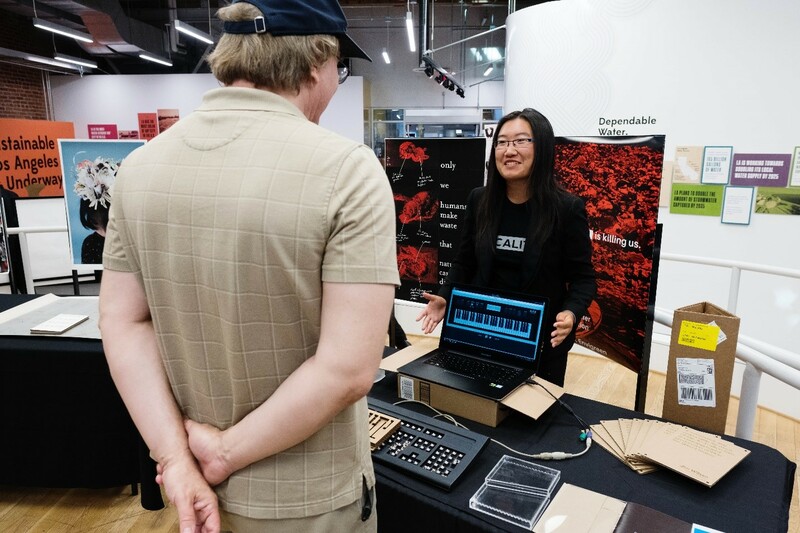 The format was a mix between TED-style talks and a design competition with innovations developed by teams from UCLA, ArtCenter College of Design, California Institute of the Arts, and LA Trade Tech College. Teams were competing to see who can create the coolest stuff from big piles of their own institution’s trash. Pretty awesome. Blake Roger from the ArtCenter College of Design team during event presentation. JUNK BATTLE! judges (from left) Kathy Schlein, Mark Eckhardt, David de Rothschild, and Ken Bielenberg. Photo by Sophie Kuller. The judges asked follow-up questions to dig deeper into their teams’ work. 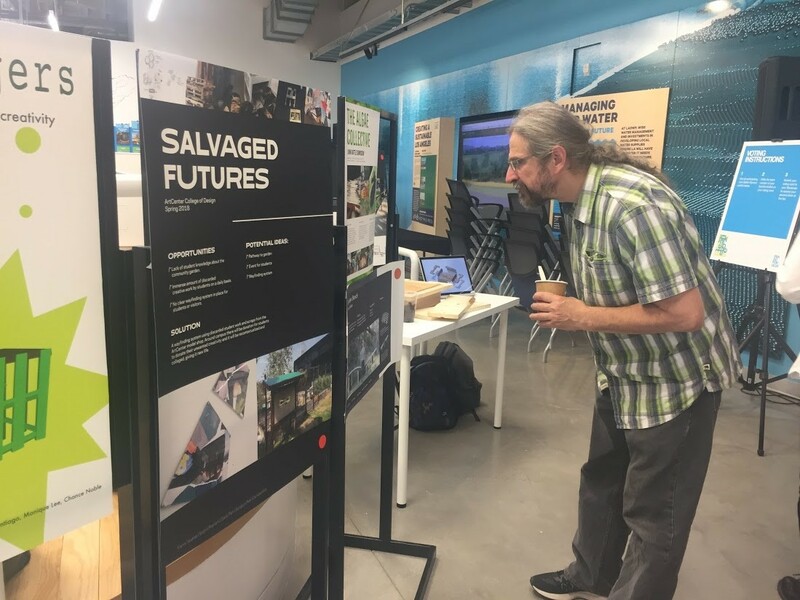 At the end of the event, judges picked a winner based on criteria focused on showing a strong understanding of the waste stream from their institutions: the process students used in dealing with and understanding the waste, the end result of their work, and the possibilities for scale. 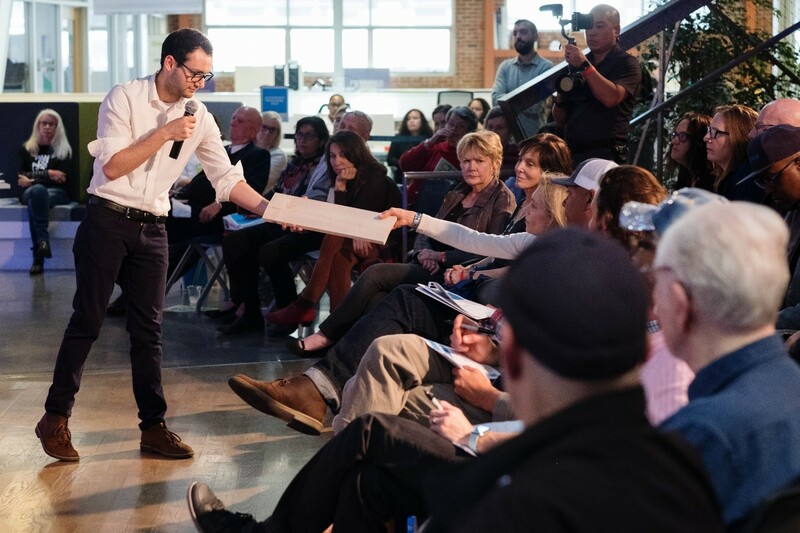 Throughout the event, speakers came on stage to address various topics around trash, including single-use plastics, LA county’s recycling efforts, a systems-thinking approach for a zero-waste campus, e-waste, and microplastics, just to name a few. JUNK BATTLE! 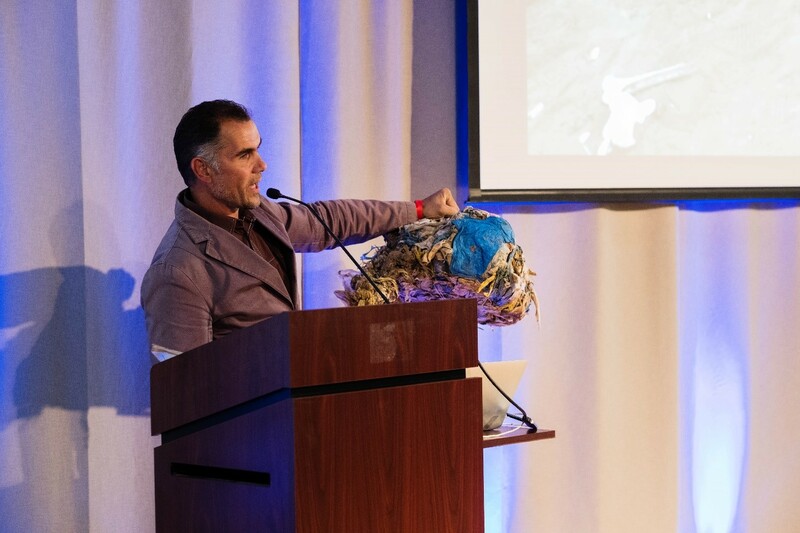 speaker Marcus Eriksen holds up a giant wad of plastic pollution pulled from the gut of a camel. 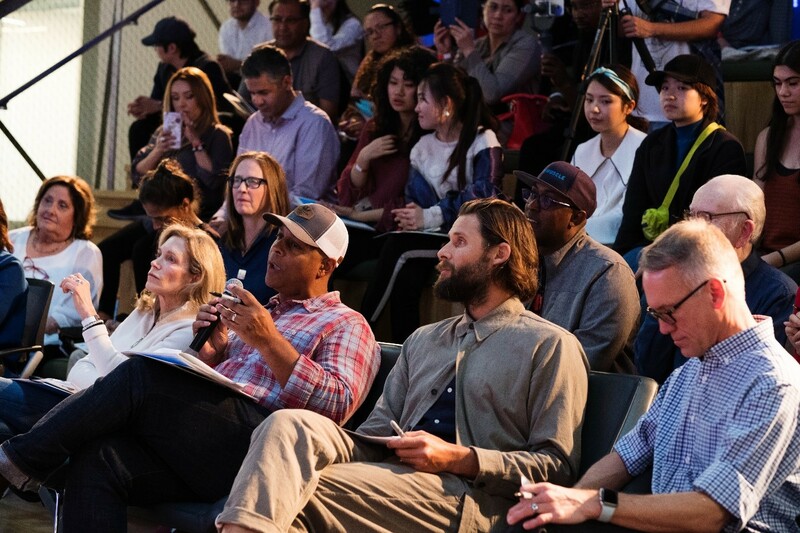 As a co-founder of a creative studio that helps companies tackling climate change launch creative solutions, I was inspired by what I learned from the speakers and the stories they shared with the crowd. As an adjunct faculty member at CCA, I was excited to see the amount of work that was generated and quality of the final designs, as well as the enthusiasm from all the students involved in JUNK BATTLE!. Members of the LA Trade Tech College team sitting on chairs created out of recycled cardboard. From left, Ray Nichols, Monica Juarez, Jessica Gutierrez, and Starla White. Photo by Sophie Kuller. I believe in this mantra. So much that I can’t help but think and see the world with this in mind. Poster by UCLA student Kay Niu for JUNK BATTLE! Photo by Sophie Kuller. Many of the speakers touched upon ideas and shared stories that fall under this mantra: the broken system in place that sorts trash, how “away” isn’t really “away,” how the materials in products affect supply chains which then affects ecosystems once those products are discarded, how the environmental impacts of plastics in oceans affects sea life and coastlines, and how consumers’ purchases affect the strain of finite resources from the planet. What would happen if every design school brought JUNK BATTLE! to the classroom? Onto their campuses? Imagine students, primed for learning and eager to get their hands dirty, getting a first-hand look at their footprint on the world. A portion of the CalArts exhibit. Photo by Sophie Kuller. Designers produce waste, but what if we were able to change the narrative that we can reverse this, where we can design not just products, but systems that are regenerative. Climate change is here. There is no stopping it. At this point, the most important thing is for everyone to step up and understand their place in the world, to get a better sense that the things we produce have to go somewhere. And that there are repercussions if that somewhere isn’t considered. JUNK BATTLE! was created to raise awareness that colleges and universities produce a ton of waste. Perhaps JUNK BATTLE! sets its sights on large companies, local governments, sprawling counties, or other industries such as apparel or electronics. A portion of the ArtCenter exhibit. How might we get the message of JUNK BATTLE! in front of key decision-makers to show them the evidence of how our footprint is affecting other aspects of life in front of them and beyond? How might we incentivize companies to design products with a cradle-to-cradle approach? How might we push for city governments to incorporate policy that puts the planet and people before profit? How might we encourage designers to approach their work through a regenerative mindset? How might we vote with our dollars so that companies know that consumers want higher-quality, longer lasting products? The team from LA TradeTech took home the first ever JUNK BATTLE! grand prize award. Their project took a holistic approach to the waste that LATTC generates, creating furniture out of junk cardboard, refurbishing computers that had been thrown away, and creating a system for reusing old concrete for permeable walkways and outdoor structures. 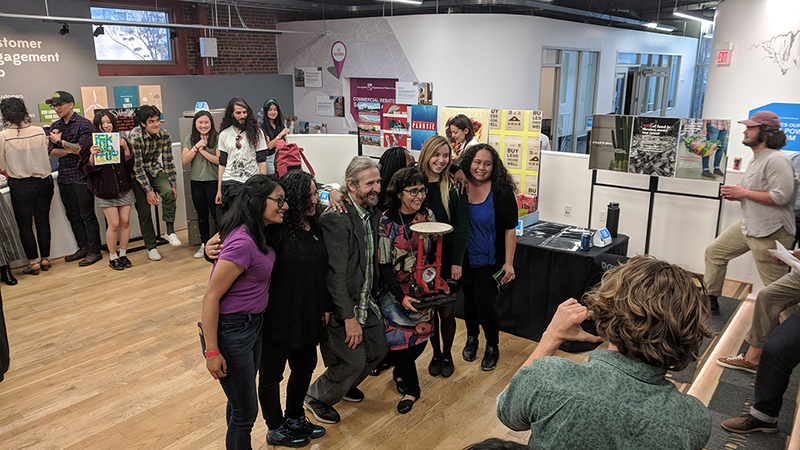 Professor Marcela Oliva (center) with LATTC students after winning both popular and juried competitions. 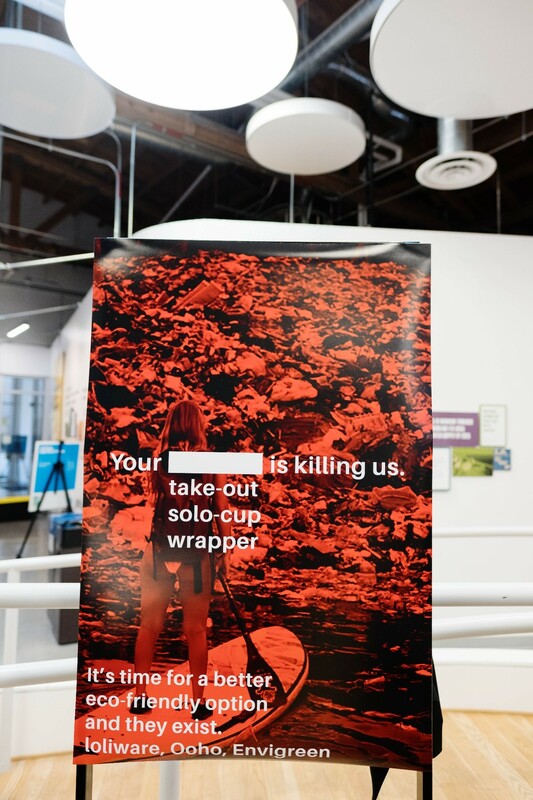 UCLA mounted an exhibit featuring a dozen individual exhibits, including posters about waste, books documenting each designer’s own experience with consumption and the trash it produces, and artifacts ranging from a hat crafted out of glass bottles and pistachio nuts to a piano keyboard refurbished from old computer parts. TK led the UCLA presentation, which highlighted her transformed keyboard. Photo by Sophie Kuller. CalArts created a blow-out performance piece with percussion instruments crafted out of coffee cups, an homage to the quilting heritage of our grandmothers, and spoken word. 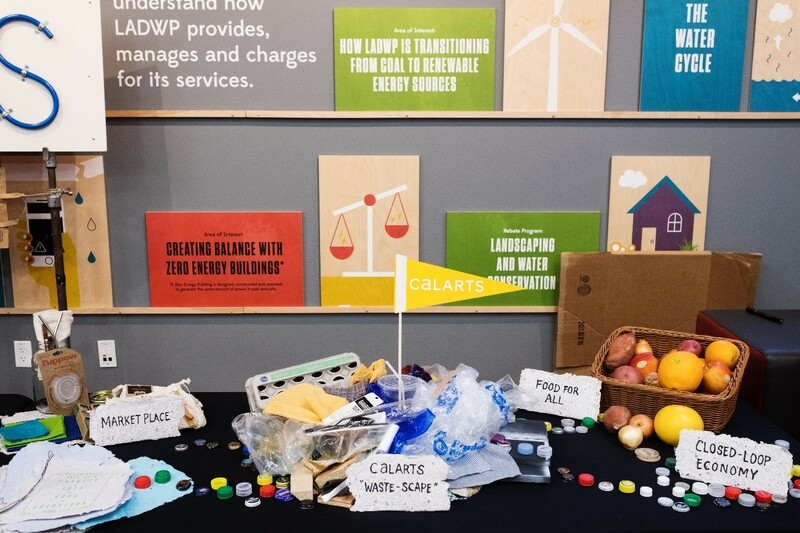 The CalArts team rethought their campus based on zero waste and sustainability goals. 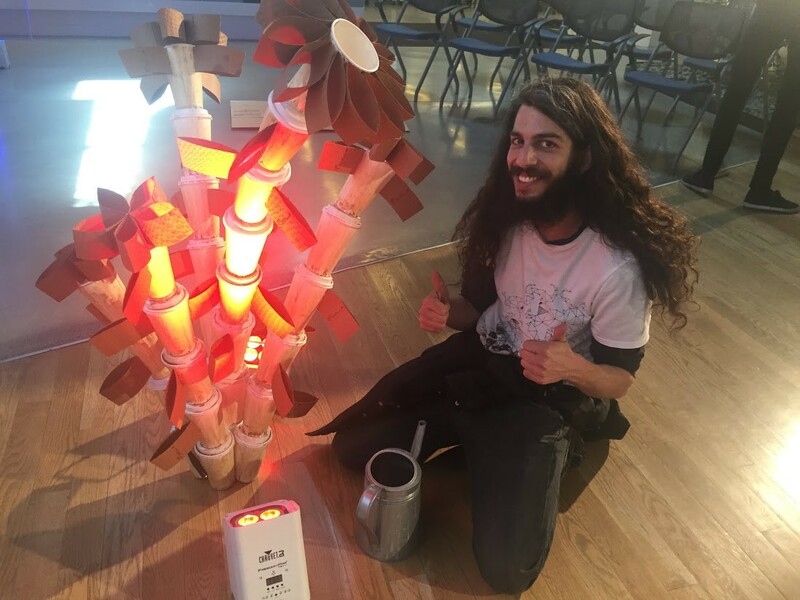 CalArts student percussionist Juhad Kuri with a sound assemblage created out of used coffee cups. ArtCenter aimed through their work to draw attention to the community garden on the Hillside campus, with the aim of revitalizing interest in it. The team’s presentation focused on carefully-crafted herb and garden boxes created from wooden pallets and designed to nest along either side of the landmark campus bridge. ArtCenter team members Quanyi Wang and Blake Roger win awards for garden boxes created out of waste. Photo by Sophie Kuller. Trophies for the event were made by LA artist Jackie Rabbit – out of junk! – and were a show-stopper all their own. Trash trophy artist Jackie Rabbit. Photo by Sophie Kuller. We expect JUNK BATTLE! 2019 to expand considerably out of this prototype event. One local municipality whose Chief Sustainability Officer attended the event is hoping to expand the competition to include teens in her area. From the individual product designers to large corporations that mine, extract, and use precious (and finite) materials from our planet, to the average consumer, we need to inform, pressure, and change the narrative so that each and every player involved in the designing, mining, and purchasing can make better decisions to ensure a healthier planet for all living species on earth. Check out #JUNKBATTLEPANDO on Instagram and Twitter. Marc O’Brien has been working with people who give a damn since 2009. He is the co-founder of The Determined, a creative studio for a climate-resilient world. He’s also an adjunct instructor at California College of the Arts in San Francisco, CA.